Id have the time of my life! I live in Valencia Spain and it never snows! I must win this! I love your giveaway! Unfortunately we do have snow in the UK but not too much mostly in the Midlands. I would like to make a snowman with my granddaughter who lives in Derbyshire but I dont drive so by the time I could get there by train (I live in Coventry) it will have probably disappeared. One day maybe she will be visiting when it snows and I will get to complete my dream. I hate snow, so I'm staying inside to quilt all the snow days, for sure. Thanks for this giveaway. On a snow day I would like to have a warm drink and snuggle under a quilt with a good book. I like your Plus Plus pattern. Thanks for the giveaway. We don't get much snow here in Alabama, but we do sadly get ice from time to time. I like to stay home in my pj's, drink hot tea, and sew! If it is snowing a lot i stay in and quilt, but when the weather lightens a little bit, skiing is the best thing to do. Richard - I'm a new Craftsy Follower and I love the Chevron Baby Quilt! Thanks for the giveaway! Recently we made ice lanterns--it's been snowy and cold. I prefer to stay inside and make things, but my kids like to get out and stomp through the snow. I tag along and take pictures. I love to make sweet rolls after going for a walk in the snow! I love to take my dog to play in the snow. She loves to catch snowballs. We don't get many snow days here in Georgia though! My favorite thing to do on a snow day is to curl up with some binding to be done and with a cup of coffee by my side, sew until I'm done. 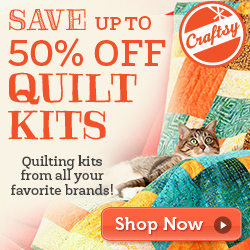 I love the Orange and Gray Helix pattern on your Craftsy site. My six-year-old son and I like to do art stuff on a snow day. He calls it, "glue, paint, cut." Thanks for the chance to win! Depends on if we still have power. If the power is on put on a good movie and knit or sew. If the power's off gather lots of candles and make good use of all of my quilts. I love your orange and grey helix pattern. Thanks for the giveaway! Not many snow days now here in Nevada. But when I lived in Alaska there were plenty! After shoveling and playing with the dogs in the snow we would make hot chocolate and wrap in blankets to warm up. Then we might have baked cookies or spent a quiet afternoon reading or TV and for me of course crafting. I love your Plus Plus. My vote is for your helix quilt pattern - thank you! I can't wait for enough snow to pull on my boots and go xc skiing! I love staying inside when it snows and work on my quilting. Thanks for the giveaway! I like your Plus Plus pattern. Plan or work on my next quilt. I live in Alberta where it's rarely mild in the winter, so not up for frostbite. It was -30C degrees this weekend (-40 with the windchill). I make a big pot of earl grey tea and spend the day playing on my longarm. Thanks for the chance! My favorite thing is to drink hot spiced cider and sew!! plus plus is my fave! Stay warm and read blogs unless David is home then we play video games or freeze in the snow! Sledding! I just watch but it is fun to watch him enjoy the snow! Awesome giveaway! I grew up in Alaska and we had plenty of snow days, hehe. We would cook a soup or stew and bake bread. It's also nice to light a fire, watch movies and play cards or board games. I'd love a copy of your Plus Plus pattern. Thanks again for a chance to win, so generous! Well, it doesn't really snow where I live...but I love to play in it when it snows nearby! Snowed in, of course go and quilt the day away. I love the Color blast quilt - looks like fun. Most fun on a snow day is dress warmly and be out with the kids taking a walk and playing in the snow. You've had a lot of snow recently, haven' you? I don't live where it snows, but probably make a snowman if I did! Depending on how I feel and what type of snow it is: I may go out and be a little boy reveling in the new snow OR i may just snuggle up in a quilt and read. I am mesmerized by the beauty of the falling snow. The flakes just fall upon us, blanketing the world, sending it all in to a little hush. The white brightens up an otherwise gray sky. I always enjoy seeing the bright blue sky after the storm has cleared. The sun shines on all the whiteness. Magnificent. I still like the Plus Plus quilt. My eyes are drawn to it. We very rarely get these snow days. And if so I would be inside freezing all day wishing for it to go away. I do not like the cold stuff. Richard and Tanya I am a follower on Craftsy. We never get snow in Ireland well rarely anyhow. But kids love to build a snowman, I just like to curl up under the duvet. I like to read sewing blogs under a quilt! Stripes, Christmas or any other stripe, is always fun, and who can't use some Kona in their stash? Thanks for the chance. I like to read on snowy days, under a quilt, of course. I like your color blast quilt. It would be fun to make for Quilts of Valor. Merry Christmas! making sure the bird feeders are filled up and then sitting by the big patio doors and watching the birds in the snow while enjoying a big cup of coffee. Well the first thing I do is go out and take pictures of all the beautiful snow on our six acres of property. Then I'd stay indoors sewing/quilting while listening to a good book on cd and keeping my fire going while drinking tea and eating double chocolate muffins. Yum! And I'd make sure I looked out the windows frequently at all that snow since it's so infrequent. I love to stay inside and sew or watch a movie. Sweet giveaway! My favourite thing to do on a snowy day is to stay as far from snow as possible :) Thank you for the giveaway. Stay inside, with fire going, and drinking hot tea. Orange and Gray Helix - thanks for the giveaway! It's a bit lame, but I like to just sit inside and look at it while I drink hot cocoa! It doesn't often snow here but when it does I like to walk and maybe throw a few snowballs! I'd love a copy of your plus plus pattern! I am not too fond of the cold, so I would like to stay inside and sew or read near a window where I can just see the snow. I love the Plus Plus quilt pattern. I just like to stay inside drink hot chocolate and quilt. My favorite thing to do on a snow day is quilt! I love your plus plus pattern! Sometimes, I like to go skiing! On other days, I prefer to sit inside and sew. Thanks for the giveaway! Honestly, I'd love to just be lazy and watch tv in my pajamas all day, with some sewing thrown in :) But alas, that will never happen since I live in TX so there will never be snow and have children so I can never be lazy. HA! When I lived in Seattle, where it does snow, I use to love to cuddle up in a quilt in front of a fire and read or sew and just relax. Now that I'm retired ans living in Mexico, I would probably go out and play in it because we haven't had any snow in the 4 years we have been here. hot chocolate, 2 kids+mom under a blanket, TV- perfect winter day! I love the Color Blast Quilt on craftsy! beautiful! I really like your rag quilt pattern and would love a copy of it. Thank you so much. HELLO, PLAY IN THE SNOW AND HAVE A GREAT TIME MAKING A SNOWMAN! HI, LOVE CHEVRON BABY QUILT! I like to make hot chocolate for the kids when they come in from playing in the snow. I love spending the day in bed watching movies with my daughter. I like your color blast quilt! Thanks for the chance to win! No snow days here in Houston, but when I was growing up in KS and we had snow days we play outside, make snow angels, but be sure to keep an area fresh so when we were ready to go in we would get several huge bowls of fresh snow and make snow ice cream. It was fabulous!! I'm all for staying inside and sewing up a storm with the occasional break for hot chocolate or soup. Many chances for that here in Minnesota! I love to go cross country skiing on a snowy day!! Thanks for the chance! I love your PlusPlus pattern - must make one of these soon!! well we have had a snow day since last thursday. I have been sewing and entering giveaways lol! Great question! Today was a snow day for me and entering giveaways most of the day was a pretty good way to spend it! I like to hunker down inside and watch a movie with my kids. stay inside with a nice mug of hot chocolate and a project. When it snows in my area I like to go outside and take pictures. Then I will come in for some hot chocolate and sew!! Merry Christmas! great patterns. orange and gray helix is my favorite. Hi Richard, We get plenty of snow here in Alberta and do not have snow days. It gets fairly cold ( we have had a big cold spell recently with a week of inside recess because the weather was too inclement to go outside. The schools remain open even when the schoolbuses don't run. Thanks for participating in the blog hop- it is always fun. I love to sit inside and drink hot chocolate with a good book. The snow's very pretty but I'll enjoy from inside. I like the snow until the new year - then it can leave. But doesn't. Until April or May sometimes. Yeah. Alberta. We love to make snowmen! I love your baby block quilt! curl up with a cup of hot chocolate and a good book! we dont get much snow here in this part of Texas I can recall maybe three years ago was the first time I had ever seen sooo mmuucch snow here, but usually.. if it does get cold and icy last the past week.. I like tos tay in and sew, or hang out and play legos with my children. Snow day = watching a series, reading a book, or browsing the net. With tea. Earl Grey to be exact. Snow days do not happen on the East Coast of Australia. Heck I don't think they have "Snow Days" in the Snowy Mountains in Australia when it does snow. We do have "flood days" where children don't come in because the school bus can't cross flooded cause ways or low bridges. I lived in town so that didn't apply to me. Some schools have had Fire danger days - where Catastrophic fire conditions combined with fires already burning make it to dangerous to go to school. Never had one of these either. Build up a nice fire, grab a book and a cup of tea and stay inside. :) Thanks for the chance to win! I like to make the house warm by baking some goodies in the kitchen. I like the simple table runner pattern. One of my favorite memories is selling the snow blower before moving south! I do miss sledding though! here we've snow almost never. So if we're lucky and get a few we go to the mountains to play with it. 2 years ago it snowed in the city, it was wonderful! I like to sit inside and drink tea. My favorite thing to do on a snow day is to laze around with the kids baking and drinking cocoa and enjoying how warm we are in the house. :) When we lived in a snowier climate my favorite thing to do was to get together with friends and huddle around drinking cocoa out of a thermos and chatting while our kids went sledding. Your orange and grey helix is my favorite. Very cool and different plus I really like the color combo. I enjoy a cup of hot cocoa and a good book, but that doesn't happen often since I have 4 kids. I do enjoy a good game of Dutch Blitz. Snow, what's snow? I live in Florida! Ok, it did snow Christmas of 1989...no one up north would have noticed but we did! The kids got all bundled up and played in the snow for several hours. When they got up the next morning there was no sign of it. So playing in the snow is a real treat for a Florida kid! Yay snow day! Stay in my jammies, watch movies with the hubby! To sit inside with an Irish Coffee in hand. As a child I loved to go sleigh riding, but now I am content to read a book or quilt. Thanks so much. I just love the windows pattern on Craftsy. I have already downloaded it. Thank you. I like the PlusPlus pattern. Sew, of course! Thanks for the chance! Spend the whole day trying to finish my Christmas quilt. We rarely have snow and it does not stick around too long, so if we get any I like to WATCH it snow! It is so beautiful Thank you for the giveaway. Well, depends on what kind of snow it is and how bad the wind is blowing. If it is a nice gentle snow, I love to go for a walk in it. If it is too windy and icy, I like to stay inside and cuddle in a quilt. I love sleeping in and curling up with tea and a nice book! Since we don't have snow in Phoenix I like to watch the weather channel to see all the snow other places because it reminds me that is one of the reasons we moved here. Your rag quilt is very pretty. My email is below connected with my gmail account. At our house, if it's a snow day that means that we have no Dish TV. Which means I spend a little more time talking to my husband, which always leads to a new project. All our projects either start on a snow day or on a long drive..
On a snow day, I'd do what I do most other days - sew! If there were no electricity, I'd do hand embroidery or drag out the hand crank. It sounds lovely to me - no one could call and want me to go anywhere, because I'd be snowed in! Love staying in my pj's and sewing or reading a book by the fire! Love lazy days when snowed in. Thanks for the chance. R & T, I hate snow, but once in TX, we got a weird 12 inches and we built a Margarita bar and my son buit a Snoopy 6 ft snow sculpture..
thanks for the pattern choice, I still havent had time to do last years..
My favorite thing to do is to delve into my fabric stash and think about all the things I should make out of it. I love to cross country ski! thanks! I like the Plus Plus pattern in your shop! I like to stay warm inside! Great giveaway, thanks for the chance! I like the Windows quilt. Snuggle by the fire and maybe a little sledding. Thanks! Order in and snuggle up ! Little girls allow me to get the full benefit out of snow day. Sledding and snow angels followed by hot chocolate and a fire in the fireplace. I love reading on snow days and making any kinds of crafts! I grab my dog and take a walk in the snow, I love it! a snow day is a perfect day to put soup in the slow cooker and read a good book or put my pedal to the metal and sew. I am still debating whether I will stay home this evening and sew or go to a potluck and visit some quilty friends. Snowy driving can be challenging. I live in Queensland Australia, it doesn't snow here but if I ever was somewhere and it was snowing I think I would have to run around in it and build snowmen and generally act like a kid in a lolly shop. We usually watch a Christmas movie, make some cookies and hot chocolate. As a work at home mom, I'm sorry to say that a snow day for my son is still a work day for me! But one of these days I'm going to take him sledding. Thanks! I also live in Queensland, Australia. Apparently a few flakes fell here one year, but melted as soon as they got near the ground. I think an open fire and hot drinks would be good on a snow day. I like your Color Blast pattern. I just downloaded the "Windows" quilt and love Color Blast too. Looks like a great introduction to triangles, which are next on my list. thanks! Stay inside and watch it snow, sit by the fireplace and sew..add in a little chocolate! We don't usually get snow. When we do get it, I stay inside and hope for it to go away. On a snow day I like to take my grand kids sledding. When it snows, I stay in the house, and quilt!!! Thanks for the chance to win! for the chance to win! !